Finally after 10 decades the info card of my Direct Save-Up account has arrived. Wow, I still can’t believe that i have to wait almost a month and a half just for the info card since I enrolled first week of January 2014. 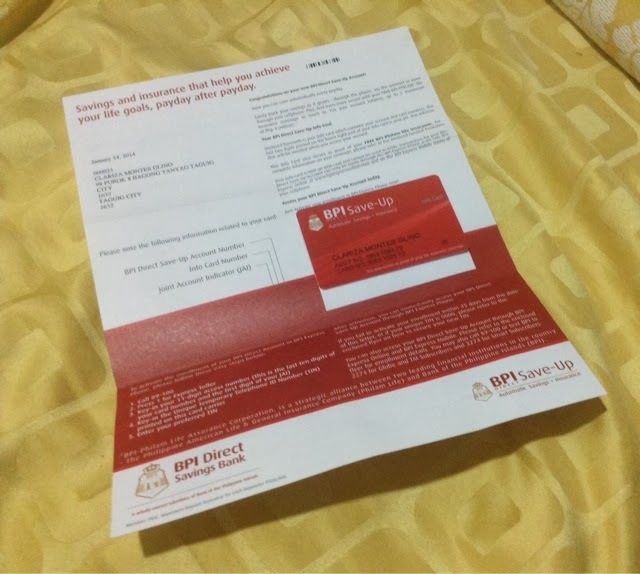 If you have no idea what this Direct Save Up account I am talking about then behold, this is actually one of the best and unique product of BPI. Another reason why I am thankful i became a BPI member. Yay! BPI Direct Save-Up Automatic Savings + Insurance let’s you automatically save an amount of your salary deposited in your ATM or Express Teller Account and let it earn a life insurancef ofor you! The insurance is through the partnership with BPI-PHILAM where in the life insurance coverage is 10x as much as the savings collected in your account!!!! The info card that artived yesterday is the proof of my account as well as the proof of coverage for my insurance. It is so easy to apply for BPI Direct Save-Up and I will blog a long and detailed post very verry soon. For now you can visit the BPI website and see for yourself this great great offer. I've been looking into this too since I want to automate my monthly savings into my emergency funds. Glad to know that it's easy to apply for and comes with insurance pa! Win! Hi question, kelangan ba passbook account ung meron ka sa BPI? or pwede din kaya kahit naka BPI na payroll card lang?